These Gluten-Free Chocolate Chip Cookies stay soft and chewy for days, and will satisfy your biggest cookie cravings! This quick recipe comes together in minutes. Chocolate chip cookies are just one of life’s greatest simple pleasures. Nothing beats biting into a warm cookie with gooey chocolate melting out of it. Add a cup of milk for dunking and you’re golden. It’s one of the more comforting things in this world, and something that should definitely not have to be given up just because you’re gluten-free. Since some of my family members are gluten-free, a really really good gluten-free chocolate chip cookie has been on my to-do list for a while. It’s something that needs to be done right, and a lot of times, gluten-free baked goods just aren’t the same as their more glutenous counterparts. These cookies though, they know what’s up. If you follow my blog, you may have noticed that in my gluten-free baked goods, almond flour is usually my flour of choice (and Honeyville is my favorite kind of almond flour). It adds a lovely nuttiness that doesn’t feel out of place, flavor-wise, like a lot of gluten-free flours do in baked goods. In these cookies, it works wonderfully, so wonderfully that everyone who ate them had no idea that they were gluten-free, and they still loved them. To me, that’s the sign that something gluten-free is a success. 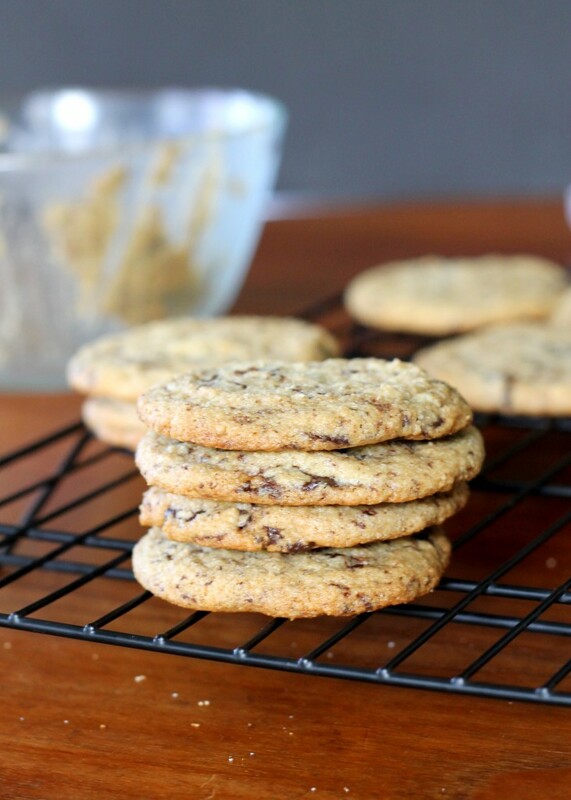 These are so easy to whip together, and definitely a crowd-pleaser, as most chocolate chip cookies are. They do need to be refrigerated for at least an hour, so plan (slightly) ahead, but I promise – they’re worth it. Enjoy! Beat together the butter and sugars until smooth. Add the egg and vanilla and mix until smooth. Mix together the soda, salt, and flour and add to the wet ingredients. Mix until well incorporated. Add the chocolate and fold it in. Cover with plastic wrap and refrigerate for at least an hour (can prepare up to 48 hours ahead of time). After refrigerating, bake on ungreased baking sheets for about 10-12 minutes or until the edges are just becoming golden. Almond flour is one of my favourite flours, gluten free or otherwise! It adds so much to baked goods – and these look great! Love that you made a gluten-free chocolate chip cookie. Sending this to my mom and sister – they always are looking for classic recipes that they can eat. I like using almond flour too for gluten-free baking. We made almond flour brownies this weekend – I agree that it adds a good nuttiness that doesn’t seem weird! mmmmm these look so delicious!!! Love that there’s such a tasty GF cookie option! These look delicious Rachel! I’ve been wanting to try some gluten free – these are going on the list! Pinned! I have yet to experiment with gluten-free baking, but it seems pretty easy to just sub out white flour for almond or another…and these cookies look so good, so I really should try it! I swear I did not see this before posting about choco chip cookies this morning! Great minds think alike! I’ve never tried making gluten-free cookies. These sure do look delicious! I am so in the mood for cookies right now. Everyone seems to be making them. 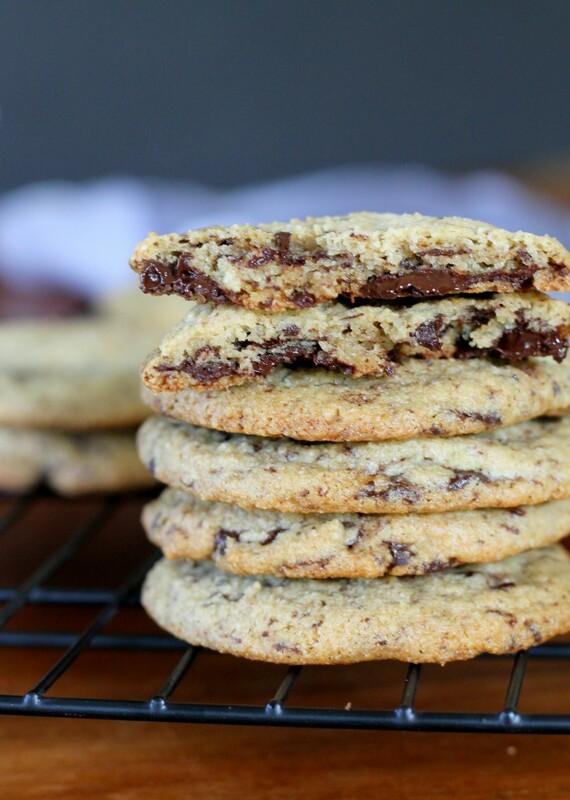 Your chocolate chip cookies look so ooey and gooey, I’m in love! These cookies look awesome! I love gluten free baking. It’s very fun to experiment and challenge myself. I have many GF friends and these look perfect. 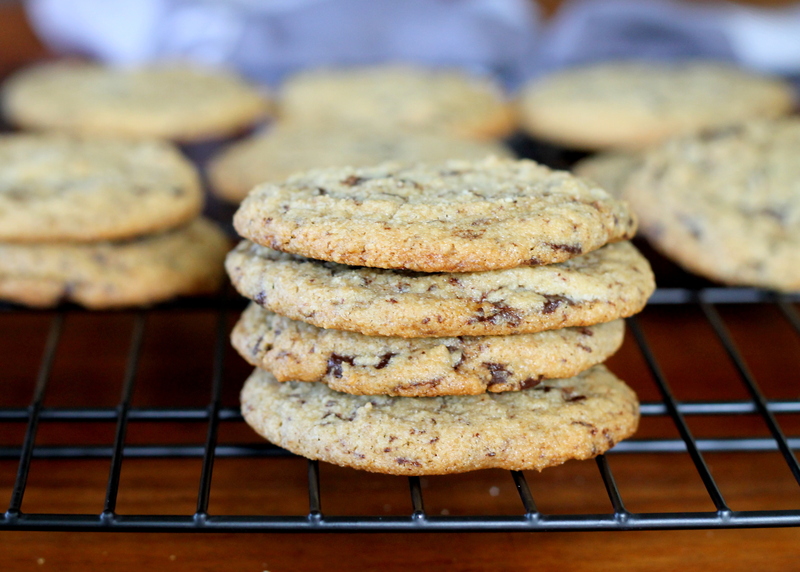 The texture, the thickness, all those chocolate chips – can I say yum?! Love how easy this is and how perfect it would be for all the Christmas cookies trays! Thanks for sharing! You are right! The sign of a really good adapted recipe is that no one knows or cares! I am not well-versed at all in Gluten free baking but these are really really beautiful! I think I’ll try this! These look so good, I must make them! I can’t use almond flour because my daughter is nut allergic but I guess I could you regular flour? When I saw this post, I had to make them that night. OMG delish! But, how do I keep them from not flattening and stay to look like cookies, they grew massively lol. This recipe looks fantastic! There are several people in my family who are sensitive to gluten, including some kids, so I’m sure this recipe would be a big hit at our next get together. Thanks for sharing! Not sure how I’m just now seeing this post because these cookies look amazing! They don’t look gluten free at all. They look so chewy and chocolaty! Wish I’d had these when my cousin, who has a gluten allergy, stayed with me a few weeks ago! Your comment about a really, really good chocolate chip cookie being hard to find? Seconded. And thirded. Wholeheartedly. These look so good though, that they must buck that trend. These cookies look totally addicting! And I love that they’re GF. oh boy. these GLUTEN-FREE CHOCOLATE CHIP COOKIES look awesome and they remind me of the thin chocolate cookies I got from Ikea before. But I’m sure this homemade version would taste even better! Can’t wait to make a batch! Wow, these cookies look ridiculously amazing and I bet so addicting. I’ve been wanting to try gluten free chocolate chip cookies, yours look perfect! I absolutely adore this recipe- ever since I found it this past winter, I’ve been making it like a crazy woman. My best friend is gluten free, and we both love to eat, so this recipe is perfect. I’ve found that making it with dark chocolate chips and dark chocolate M&M’s gives them an incredible flavor. Thanks for sharing with us!